If you want to learn to read tarot cards but have found yourself overwhelmed by just the thought of memorizing 78 cards meanings, please breath a deep sigh of relief right now. If you have felt intuitively drawn to the deck followed by a sense of overwhelm then this class series is for you! You needn't memorize card after card. In fact by honoring your deep intuition you will instead come to understand how the cards speak to you and through you. Reading is part of that wonderful sixth sense that comes pouring out of us when we are inspired and having fun. All my students tell me that they have opened up a new way of understanding the world and themselves after taking this vibrant eight week series. They each say that they trust their intuition so much more now. They site the tarot class as offering a spiritual respite which opened a doorway to their higher self. This class series is geared toward both those who wish to read for others as well as those who wish to read primarily for themselves. These classes are based on group work and short lectures as well. Just ask my students though, they will tell you that these classes also offer an oasis of new thoughts and a supportive place to explore and grow your intuition with like minded others. Jenny’s unique learning approach with the tarot utilizes archetypes. These patterns and themes found in nature, and culture are also found in the stories you tell. Archetypes help you understand, honor, and explore your own unique nature. There are different complimentary symbol systems or lenses, that make up the tarot. Jenny will present different focuses when reading the cards. Each focus will add more depth to your learning. Jenny's classes will cover the Celtic Cross spread, personality development in the court cards, techniques for growing your intuition, working with the four sacred elements in tarot, archetypes and the major arcana, sacred numbers, as well as understanding how the tarot speaks through stories and symbols. The classes begin with an opening meditation and end with a closing one--both uniquely geared to open up the tarot to you in just the way that is right for you. These classes emphasize group work as well as one on one time with the instructor. However with Jenny's system you get to choose which way is most natural for you. Different people have a unique affinity for different styles of reading. Jenny sees this is the key to unlocking your unique way of reading the cards. Jenny will help you identify your intuitive strengths so we can create a soft spot where the cards open up for you. This intuitive identification process starts at the very beginning of the first class and we will be refining your skills and gifts through out. Once you open this door it is easy to read tarot. And easier too to trust your intuition in other situations. I also offer private one on on lessons which allow for wonderful individualized attention throughout. These are a great choice if you do better one on one. Classes can be held at my office or via Skype for your convenience. If you are interested in knowing more please don't hesitate to reach out. I am happy to send you a class outline. Whichever class option you choose I look forward to accompanying you on your tarot journey! Come join a class and find your unique intuitive footing with the cards. To see more click here for a sample of me doing a reading on youtube: tarot presentation. Jen has a unique way to really learn the deeper meanings of the cards and their symbols. Working with her and practicing the layouts was invaluable and I am very thankful to have found her. The knowledge is astounding and it has truly helped me take my tarot readings to the next level. I really enjoyed the tarot classes that I had with Jennifer Sieck. I signed up for her tarot card classes and I got so much more. 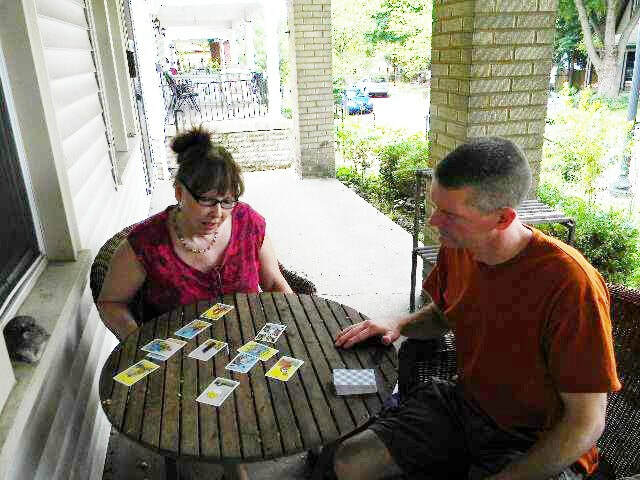 She was very thorough with the tarot and took the time I needed to help me learn everything I needed from my deck. But It was so much more than I ever expected. What started as a series of classes ended up being a spiritual journey. I would highly recommend this experience to anyone. 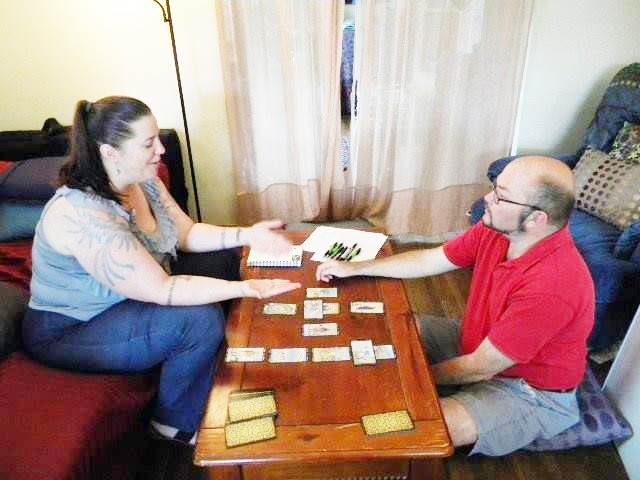 "I had the pleasure of being in one of Jenn's Tarot group classes. I have to admit I was a little nervous and felt that I wouldn't be able to understand it. Then Jenn begin teaching in her wonderful and unique way. She has an incredible gift of explaining the most profound information in the most simplest and clear way. Now that I'm in a new stage of my life, I am eager to attend another class to see how much more I can learn. Thanks Jenn for all you do!" but with little success. Jenny taught me a different way of looking and relating to Tarot. Her approach is different & very informative, she tapped into the Elements which I found helpful. For me, I couldn't have found a more gifted teacher. She showed me how Tarot isn't about "telling the future" as much as how Energy and Archetypes show up in your life. She shows you ways to engage your intuition and is very encouraging. I would recommend her private sessions if you are looking for a one on one approach." 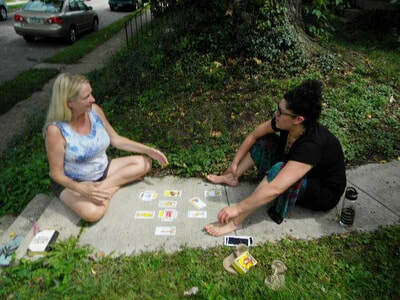 "Every week I look forward to my private Tarot Lesson with Jennifer. I've always been interested in studying Tarot and finally took the first step. Weeks later I am even more intrigued thanks to Jennifer's soft encouragement. Each week I gain further insight into my creative intuitive self and I look forward to continuing my practice and eventually sharing with others. I especially have enjoyed my studies in Chakra Movement. Love.."
"I don’t kno﻿﻿w w﻿﻿hat impres﻿﻿sed me m﻿﻿ore, Jenny’s knowledge of tarot or her ability to create a learning experience that touched me on so many levels. The group tarot class brought together layers of knowledge, from numerology, chakras, mythology, astrology, eastern and western thought, leading us easily and naturally, step by step. I didn’t think I would be able to absorb so much, but she made it fun and so interesting. Her intuition and counseling skills blend seamlessly in her teaching of the archetypes and the fine points of reading for yourself and others. I feel privileged to have found Jennie’s class exactly when I was ready for it. Jenny is a gifted reader and teacher and I count this class as a valuable step in my spiritual journey. Thank you, Jenny!" ﻿﻿"I recently completed an 8 Week course of tarot classes with Jennifer. I am an experienced reader and have regular clients who have been very pleased with their readings in times past. But I saw an opportunity with Jennifer to benefit from her broader view of the tarot as well as the depth of understanding that her Jungian background brings to the table. I can tell you, I had no idea how much I could learn! My clients are more than happy now. Now they are blown out of the water. And I now feel a connection to the tarot that is the difference between a casual friendship and a committed relationship. Jennifer is an excellent teacher with multiple skills to share. If you want to know your tarot deck inside out and backwards, sign up for Jennifer's next class." "I have had the great fortune to receive pure and powerful guidance from Jenny Sieck's tarot classes. I found Jenny to be a calm oasis in which I was not judged, but rather fully supported in where I was at the time. Her profound and very personally relevant feedback and guidance always hit the mark. I left each class feeling listened to, supported, and empowered. Her classes were so helpful in taking a very complex system and making it so much more accessible. What once felt like an overwhelming subject now feels workable. Jenny has many gifts and is truly heart centered. If you find yourself in need of guidance and perhaps a new approach to your issues and concerns, I highly recommend gifting yourself and those you love with this intuitive class series. Jenny is an exceptional teacher, a vessel of wisdom, humor, and acceptance." "Jennifer's Intuitive Tarot class really made a difference in how I viewed tarot and how I put it to use in my life. I feel like I can toss the books, and that I *want* to toss the books, and let the cards speak to me as they wish. Imbued with my own spiritual grounding and the wisdom of the ages, Tarot is proving to be a cornerstone of my meditative and spiritual work, and I owe that all to Jennifer's teaching. Plus, her class is a blast! Highly recommended!" Intuitive group Tarot Classes on-site are sold in packages of eight 60-minute sessions for $250.00. The private class option $300.00 for the package, can be held on-site, via Skype, or by phone (US only); whichever you prefer.